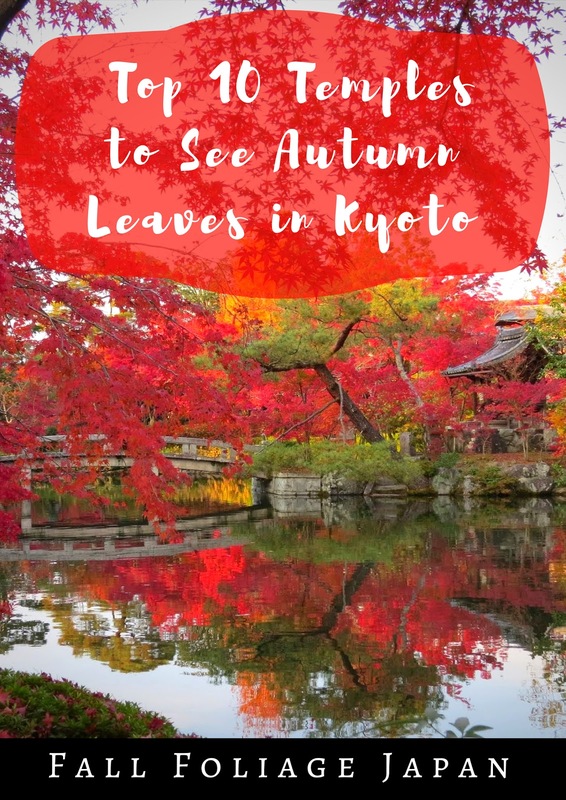 Japan in general and Kyoto specifically is famous for its Autumn foliage and temples. 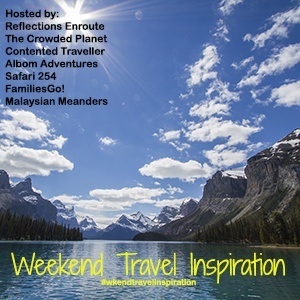 The combination of the two was one of the most memorable aspects of our one week exploring Japan by train in November. Here are ten temples that we think are worth visiting for 'leaf peeping' and a generally mindful experience in Kyoto. 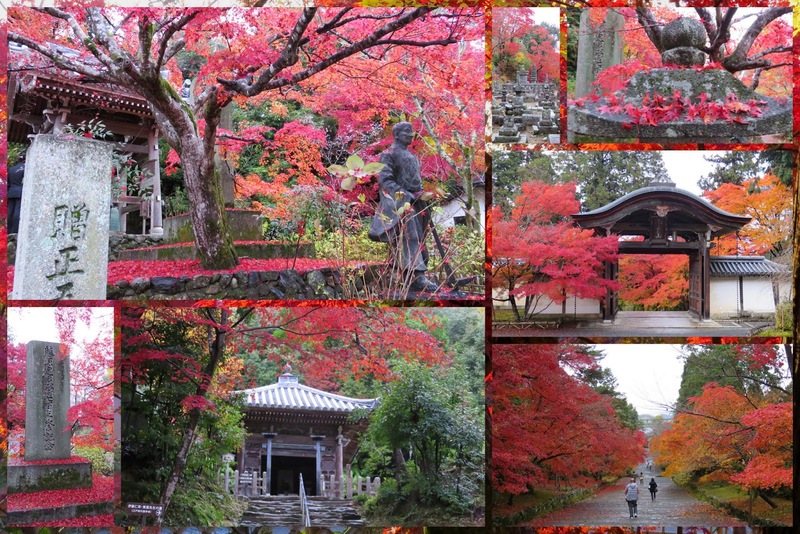 Most temples in Kyoto cost between 300 - 500 yen to enter (about 3 - 5 USD at the time we visited). Ginkaku-ji or 'Silver Pavilion' is located at the top of Philosopher's Walk in Kyoto. 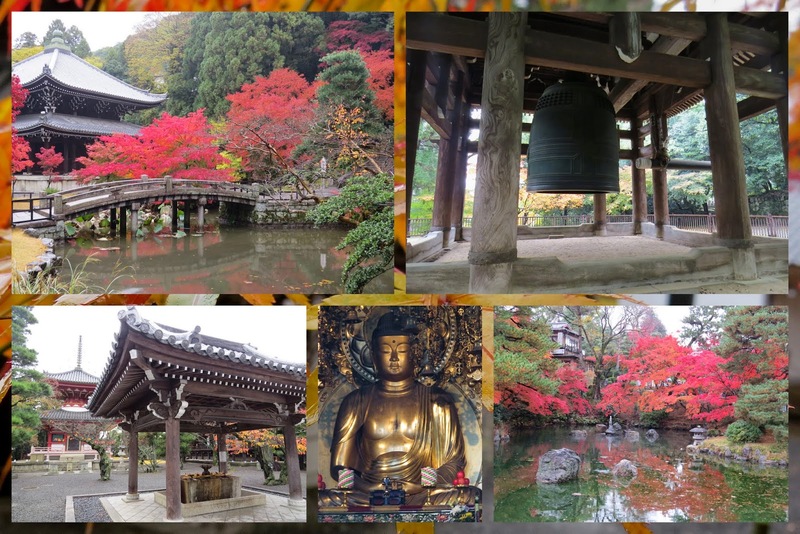 It was the first temple that we visited and we were simply amazed at the Fall foliage colors all around us. 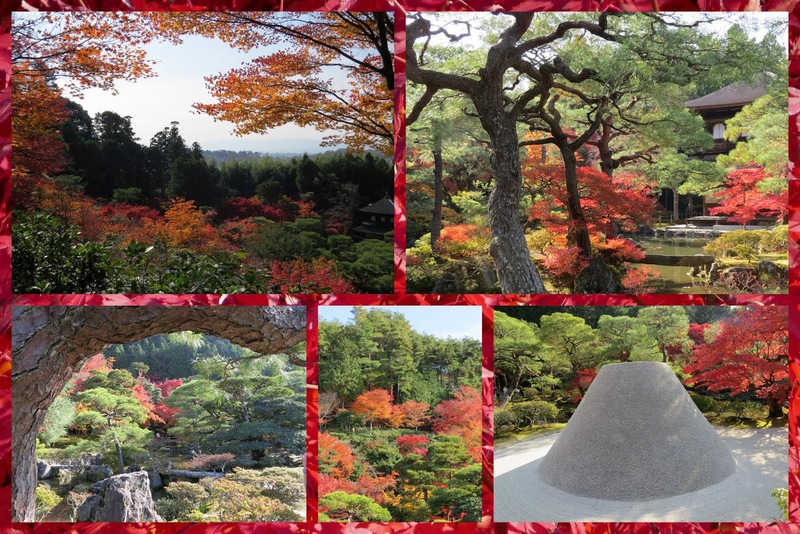 We were able to hike up hill a bit to take in panoramic views of the Autumn leaves all around us. Hōnen-in is a smaller temple just a short walk from Ginkaku-ji in Kyoto. The piles of combed sand surrounded by yellow and orange leaves made an impression on us. All I can say is 'Wow!'. 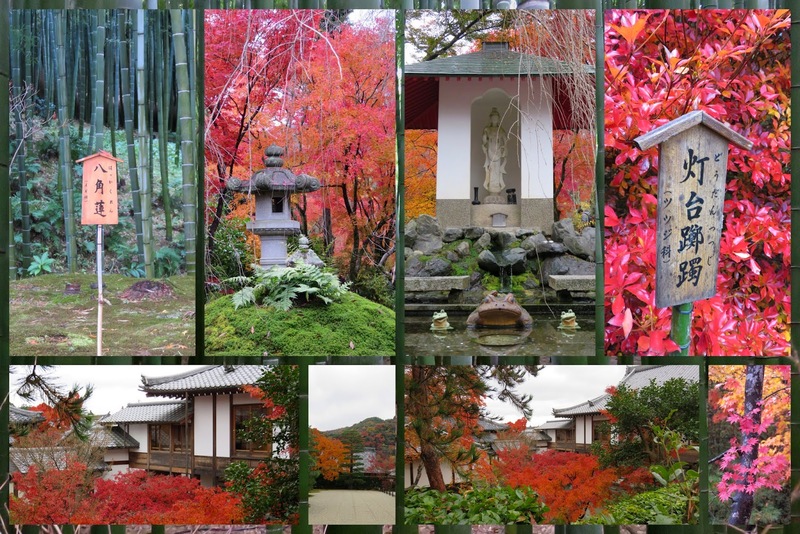 When we walked up to Eikan-dō in Kyoto, I was simply in awe of the technicolor around me. I'd never seen such amazing foliage! We almost decided not to go in because there were massive throngs of Japanese tourists about making it quite crowded plus this temple was a bit more expensive than the others (around 1000 yen per person if I recall correctly). I'm so glad we did brace ourselves and plunge into the masses because this temple was the most beautiful of all that we saw and the colors were too gorgeous for words. A little further on from Eikan-dō at the far end of Philosopher's Walk in Kyoto, we stopped at Nanzen-ji. An old stone aqueduct runs the length of the complex and makes for a nice backdrop to the foliage. 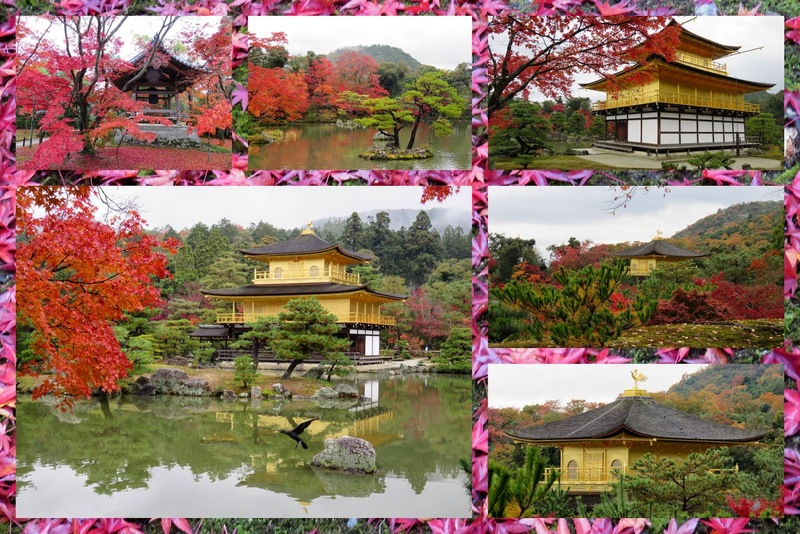 Kinkaku-ji or 'Golden Pavilion' is a short train ride from Kyoto city center. The temple is covered in gold leaf and looks even more opulent when surrounded by the gold tones of the surrounding leaves. Simply stunning. Chionin-ji is known for its giant bell which was the largest in the world from the 17th to 19th centuries. 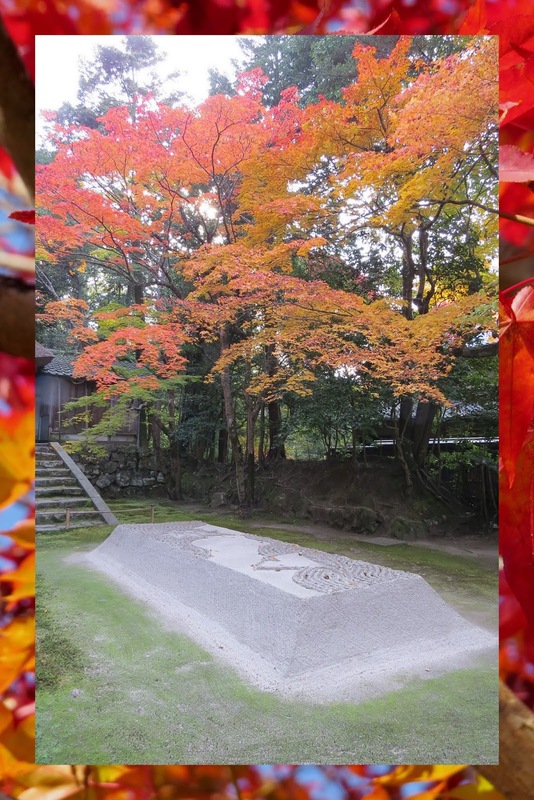 Once again, the surroundings of this temple which are within walking distance of the center of Kyoto were even more special when enhanced by the seasonal Fall foliage. Tenryu-ji Temple sits at the edge of the bamboo forest on the outskirts of Kyoto. The deep mossy green throughout the grounds makes the reds and oranges of the maples really 'pop'. 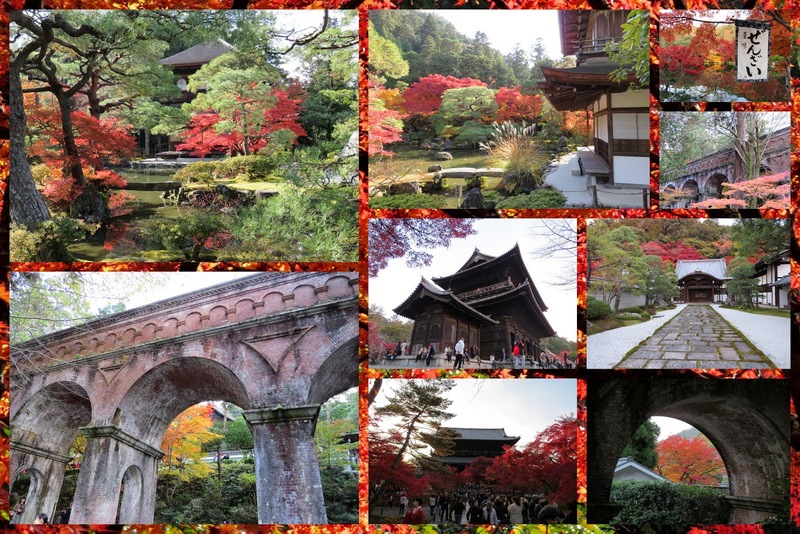 Nison-In Temple is walkable from Tenryu-ji in Kyoto along a quiet path. It was a wet day which seemed to enhance the colors both on the trees and on the ground as the Fall leaves fell. We embarked on a steep uphill climb and were rewarded by being almost completely alone in quiet solitude as we explored a terraced graveyard at the top of the hill. This place was definitely off the beaten path but was one of my favorite temples that we explored in Kyoto. 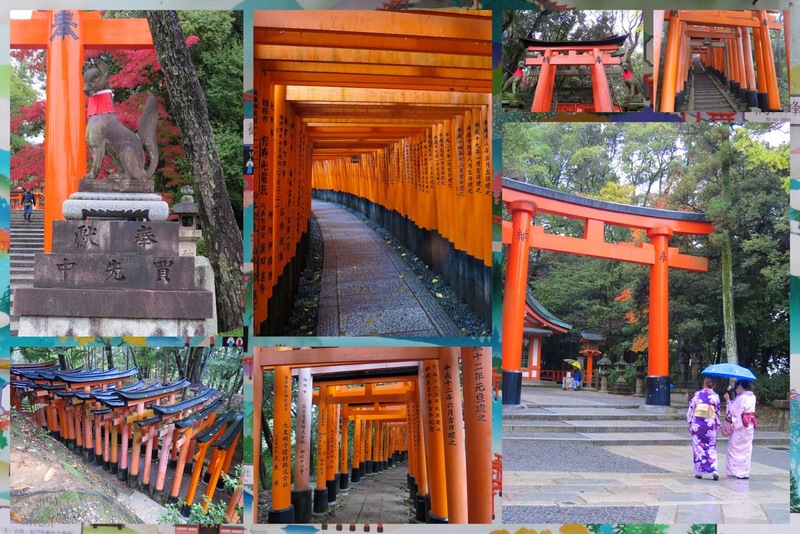 Fushimi Inari Shrine is most famous for the thousands of bright orange torii gates running up the hillside in Kyoto. The pockets of fall foliage added an additional splash of color. I'm sad to say that we didn't have enough time to climb all the way to the top (it would have taken a couple hours and lots of stamina) but we did note that the higher we went, the less crowded it got and we were able to enjoy the temple in peace. 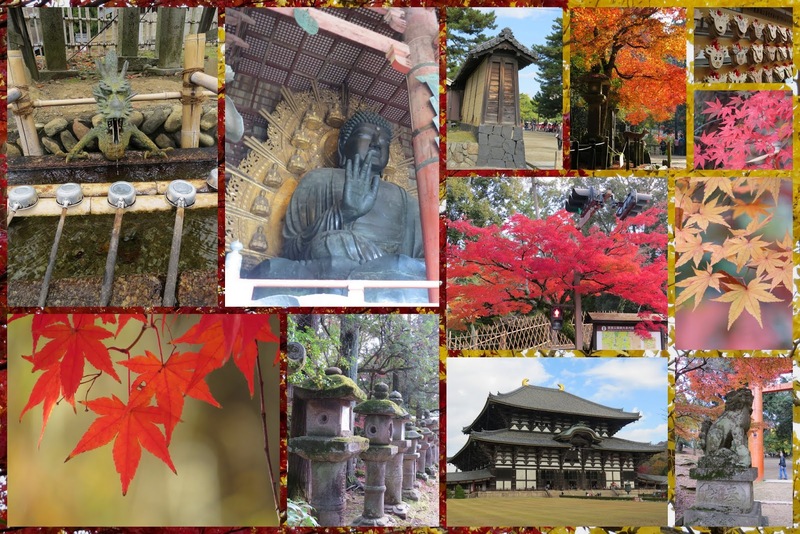 I cheated slightly on this one but felt it was fair to include because Nara is an easy day trip from Kyoto or Osaka and is another beautiful place where temples and Autumn foliage collide. Temple after temple sit on the outskirts of town. We saw some amazing leaf specimens and this colorful environment somehow made the hoards of deer that live here seem a little less intimidating (vendors sell 'deer crackers' but there are copious warning signs about how the animals can be quite aggressive). 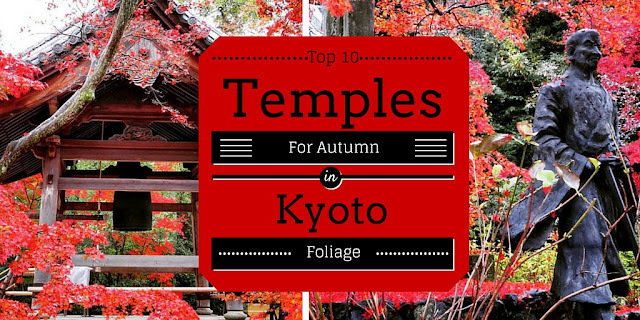 What other temples in Kyoto and Japan at-large would you recommend for leaf peeping? 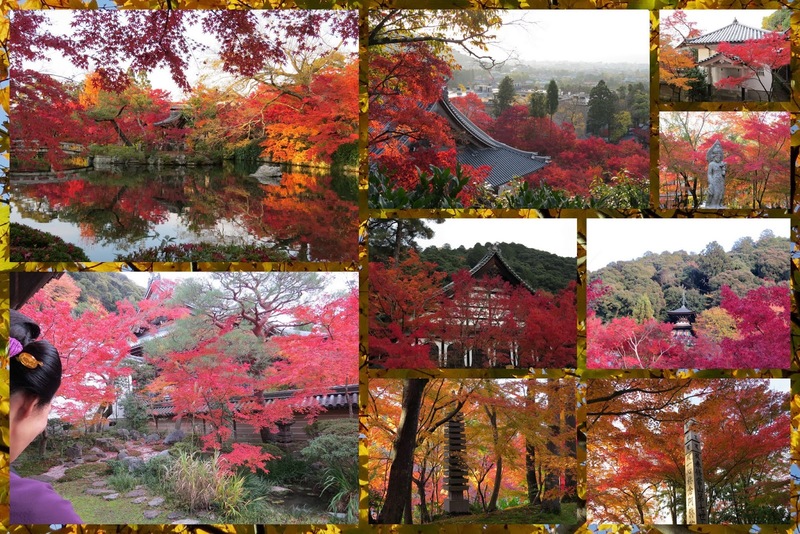 Read about fall foliage in Japan. Learn about the best temples to see autumn leaves in Kyoto.